I love these vintage brooch wedding bouquets made by Aunties Vintage. I see these as future heirlooms to be passed down the family. 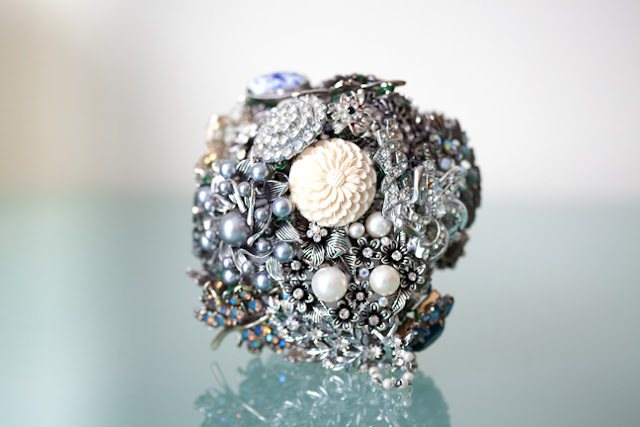 If you commission Sue, of Aunties Vintage to make one for you, I expect she can cover the 'something old, something new, something borrowed, something blue' all within the bouquet! 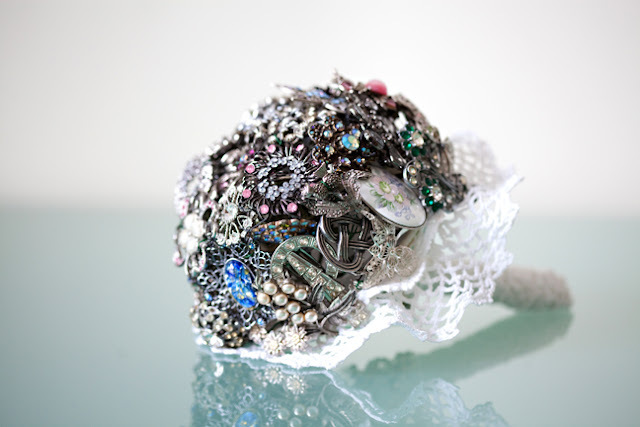 Sue will design a bespoke bouquet for you to include representation of your family and you as a couple. Your groom could have a coordinating button hole. 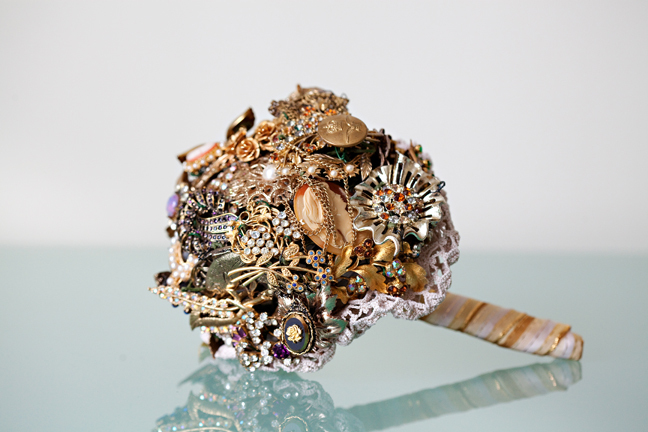 Brooch bouquets are also available to hire and could be customised for your wedding with a sentimental piece. 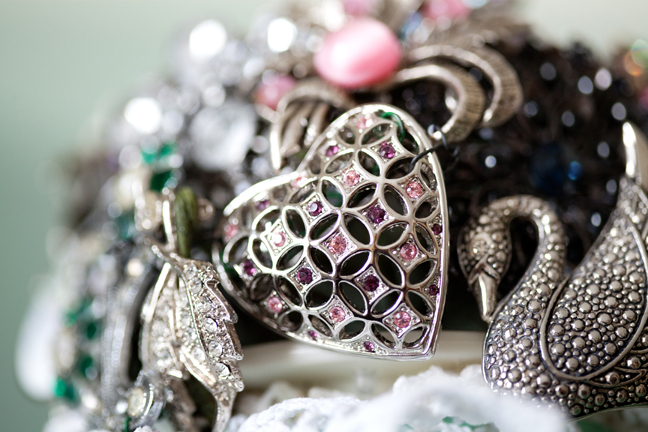 Prices are dependent on the volume of brooches used and the nature of the metals and stones in the brooches. These are for keeps and could be handed down from generation to generation. “Aunties” was established in 2010 and offers event styling, the hire of vintage crockery, cutlery and champagne saucers. They also have a HMV Bijou gramophone, an imperial typewriter, candelabras, bunting and an eclectic mix of treasures available to hire as props. The name of the company is homage to my two maiden aunts, Violet and Margaret. They always served tea in bone china cups, you would never see a milk bottle on the table and they prided themselves on their home “bakes”. I have inherited a tea set that was collected by my aunt, a cup one week, a saucer the next when she received her wages from working as a nurse in Aberdeen. I now have a huge range of crockery for hire to make your event pretty, unique and green. 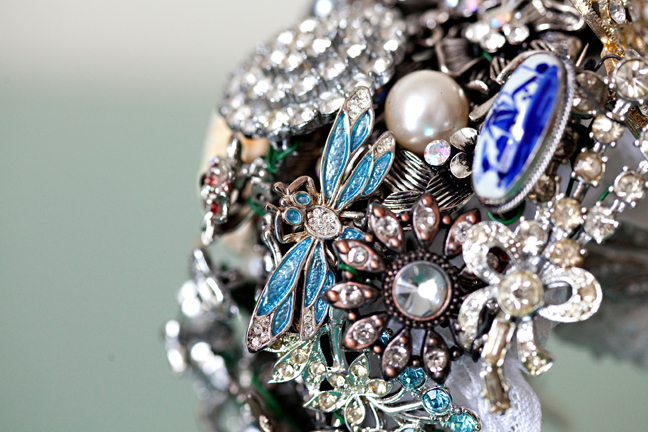 To see Aunties Vintage website click HERE.